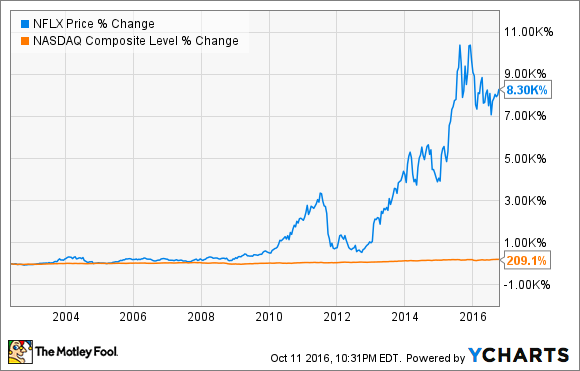 Netflix Stock History: Can This Home-Run Growth Stock Continue to Soar? The meteoric rise of Netflix’s stock since its IPO is the stuff of investing legend, which is exactly why Netflix shares remains a buy at their admittedly expensive valuations today. If there's been a unifying theme for Netflix's (NASDAQ:NFLX) stock in the 14 years since its IPO, this headline from CNN Money perfectly sums it up: "I love Netflix (but not the stock)." That article appeared on April 23, 2003, just less than a year after Netflix's IPO. Fast forward to today, and the commentary around Netflix's stock price remains alarmingly the same. The only difference? Netflix stock today sits roughly 5,900% higher. Since the ticker symbol NFLX began trading on public markets, Netflix has led the dawn of the streaming revolution, created a new template for how winning content is created, and minted fortunes for its investors amid its soaring stock price, as you can see in the following chart. However, this Netflix chart barely scratches the surface of the streaming giant's past, present, and future. As such, let's delve deeper into Netflix's stock history to see whether its stock remains a buy today. Founded in 1997, Netflix has changed dramatically over the years. As many will undoubtedly know, Netflix's original business model operated as a subscription DVD rental website. Its timely rise coincided with the mass-market adoption of in-home DVD players in the U.S. The company grew quickly in the years following its inception, rising to more than 120,000 paying subscribers by the time it filed its S-1 IPO prospectus with the SEC in 2000. By the time Netflix ultimately conducted its initial public offering in 2002, the company's subscriber base had increased to more than 600,000. From there, Netflix continued to grow exponentially. By 2005, Netflix enjoyed 4.2 million members and generated $682 million in annual revenue. In 2007, the company saw one of the most important developments in its history -- the introduction of streaming -- and Netflix moved quickly to integrate its streaming service into a number of major media platforms like Microsoft's Xbox, Apple's iPad, and more throughout the late 2000s. Netflix's more recent history has largely been defined by two driving trends -- international expansion and original content. Netflix first moved into Canada only in 2010, and today the service claims it is available worldwide. The effect on Netflix subscribers has been dramatic. Netflix's global subscriber base has grown roughly 30% in each of the past two years. The company counts a whopping 83 million global subscribers as of Netflix's most recently reported quarter. As many of us know, hit original content series like House of Cards, Orange Is The New Black, and the like have not only helped differentiate Netflix from rival streaming services, but also established the company as a creative power to rival the entertainment industry's famed incumbents. The cumulative effect on Netflix stock speaks for itself better than I ever could. Even if you disagree with its valuation -- more on that below – the overall result has been strong. Since its IPO, Netflix stock has unabashedly eviscerated the market, even after its slight pullback in recent months. However, any investor worth his or her salt knows that past performance doesn't guarantee future performance, so let's dive deeper into the outlook for Netflix's stock price today. Funny thing is, in assessing Netflix stock's investment appeal today, the same headline from the opening of this article still applies. Netflix's innovative leadership and mass-market opportunity should help the business continue to thrive for years to come. However, owning a share of that growth still will not come cheaply. As just one example of its still-massive runway, Netflix's subscriber base today only counts roughly 14% of global fixed broadband users, which itself could understate its market potential as wireless connectivity will help bring new potential users online in coming years. What's more, the company's content spending continues to remain absurdly productive relative to its competition. According to estimates from UBS, Netflix yields 12.5 hours of viewership for every dollar it spends on content, both original and licensed. For context, rivals Amazon.com and Hulu generate about four hours watched per dollar of content spending. In just about every sense, Netflix's business remains full of momentum with plenty of opportunity. The problem lies in Netflix's valuation. Simply stated, owning a piece of Netflix's booming business just doesn't come cheaply. Case in point: Netflix stock currently trades for roughly 316 times its last 12-month earnings and 116 times its next 12-month projected earnings. Its enterprise value / EBITDA multiple, another popular valuation metric, also trades at an elevated 139 times multiple. Though its lower growth outlook merits a cheaper valuation, the S&P 500 currently trades at 24 times, which is well above its long-term historic average, as well. Like another longtime Fool favorite (and Netflix rival) Amazon, game-changing growth stocks rarely ever appear cheap. However, their innovative ability and massive long-term markets tend to allow these companies to justify their elevated pricing. While Netflix remains a "love the company, hate the stock" story, hopefully history can prove that Netflix has what it takes to exceed its expensive share price.